What three things does a plant need to grow and thrive? Water, sunlight, and soil, of course! We need these three items in our spiritual gardening to have growth in our Christian life also. Plants need a good foundation of soil to start their growth. For Christians, our “soil,” our foundation, is Christ. Christ nurtures us and supports us. He gives us a place to extend our roots in safety. Just like a plant needs nutrient rich soil to thrive, Christ gives his children every possible nutrient we would ever need: Peace, Love, Encouragement & Wisdom… and His supplies are unlimited. The Bible is our sunlight. Plants grow towards the light. They long for the warmth and strength that only sunlight can give. As children of God, we should also lean towards the light, His Word, for guidance, and strength. It can give us warmth and comfort in times of struggle, and lead us on the clear path in times of doubt. The Bible is a source of many things we need in our Christian life. Last but not least, plants need water to sustain them. I like to think of that much-needed water as fellowship with fellow believers. God didn’t intend for us to grow alone, but to be there to encourage each other in Christ. Fellow believers are meant to come together, loving one another and supporting each other as we grow. Fellowship can be refreshing to a soul, just like water to a plant. It can help us perk up on a particularly draining day or quench a thirst. Water can be a vessel for the nutrients we need to grow. Now that we’ve talked about the essentials, let’s not forget about the “weeds” that can sprout up in our gardens, both in real life and in our spiritual life. Weeds come in all shapes, colors, and sizes. The worst weed in our spiritual gardens, Satan, can sometimes be easy to spot, while other weeds, like wayward friends or feelings of bitterness and anger, can be hard to keep away. Weeds choke plants, creating an atmosphere where growth can be impossible. Weeds work in our lives much the same way. They distract us from Christ as we pour all our vital nutrients into them instead of our Christian growth. Weeds can crush smaller, weaker plants easily. We need to strengthen ourselves with good soil (Christ), sunlight from above (His Word), and refreshing water (fellowship with fellow believers), so we may find ourselves with strong roots that dig into our foundation, and have a close spiritual walk with our Father. 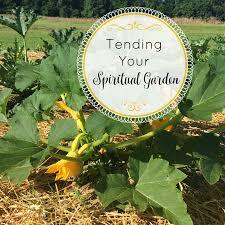 Dear Lord, help us to tend our spiritual garden. Help us to strengthen ourselves with good soil, sunlight from above and refreshing water. In the Name of Jesus, Amen.